Zeitgeist Films offers a free screening of the acclaimed documentary Eva Hesse (2016) to attendees of CAA’s 2017 Annual Conference. Directed by Marcie Begleiter and produced by Karen Shapiro, the film is the first feature-length appreciation of this important artist’s life and work. Eva Hesse makes superb use of the artist’s voluminous journals, her correspondence with her close friend and mentor Sol LeWitt, and archival and contemporary interviews with fellow artists—among them Richard Serra, Robert Mangold, and Dan Graham—who recall her passionate, ambitious, and tenacious personality. The screening will talk place on Wednesday, February 15, from 7:00 to 9:00 PM in the Time Warner Screening Room, Lewis B. and Dorothy Cullman Education and Research Center, Museum of Modern Art, 4 West 54th Street, New York, NY 10019. The museum is half a block from the New York Hilton Midtown, the headquarters hotel. The audience is limited to fifty people. Please send your RSVP (required) to emily@zeitgeistfilms.com. The American Council of Learned Societies held a premiere showing of George Clooney’s Monuments Men, the Hollywood film based on Robert Edsel’s The Monuments Men: Allied Heroes, Nazi Thieves and the Greatest Treasure Hunt in History. The film demonstrates the contributions of art historians who investigated the thousands of art works and archival manuscripts looted by the Nazis and secretly stored in mines around Germany during the WWII. Members of ACLS initiated the interest in saving European monuments during WWII and many CAA members participated. Former CAA President (1952-1955), Professor Lane Faison who chaired the Art History Department at Williams College, in Williamstown, Massachusetts from 1940-1969 that, during his time, graduated so many students who became museum directors (Thomas Kerns, Glenn Lowry, Roger Mandle, Earl Powell) served in the Office of Strategic Services (later to become the CIA) in 1945 assigned to a group called the Art Looting Investigation Unit to find out what the Nazi’s had done with the art that they had stolen. He was one of three art historian officers including James S. Plaut and Theodore Rousseau who collected evidence for the Nuremburg Trials. The Monuments Men relied on these extensive lists to track down the stolen work. Jack Hyland, CAA’s Treasurer, investment banker, media advisor and author (see www.jackwhyland.com) of a thriller The Moses Virus: A Novel and Evangelism’s First Modern Media Star: Reverend Bill Stidger (a biography of his grandfather who was the model for Elmer Gantry) interviewed Lane Faison on his 90th birthday for the July 1998 CAA News article: “People of the Eye” [http://www.collegeart.org/pdf/LaneFaisonInterview.pdf]. The article covers, in part, CAA President Faison’s recollections of being a Monuments Man. What a thrill it was to see at last a Hollywood film where art historians are portrayed as heroes on the silver screen –granted a bit past their prime but able to screw up their courage to capture a sniper, lose their lives in defense of Michaelangelo’s Bruge Madonna, and retrieve the entire Ghent Alterpiece just ahead of the looting Russians. The film is complete with patriotic music and outstanding images of the original works of art instead of the typical reproductions. The major facts are adhered to and the reality is driven home that many people died in the effort to retrieve the art important to world heritage with little support from the military, Congress and the White House. CAA is giving away free movie tickets to special screenings of The Monuments Men, directed by and starring George Clooney, in four cities across the United States to its members. The organization has ten tickets (five pairs) for the New York screening; ten tickets (five pairs) for Los Angeles; six tickets (three pairs) for Chicago; and six tickets (three pairs) for Houston. Please send your name, the name of your guest, your city, and your CAA User/Member ID# to caanews@collegeart.org by 3:00 PM EST today. Winners will be notified after 4:00 PM. The Monuments Men were a group of approximately 345 men and women from thirteen nations who comprised the MFAA section during World War II. Many were museum directors, curators, art historians, artists, architects, and educators—and also members of CAA. Together they worked to protect monuments and other cultural treasures from the destruction of World War II. In the last year of the war, they tracked, located, and in the years that followed returned more than five million artistic and cultural items stolen by Adolf Hitler and the Nazis. Their role in preserving cultural treasures was without precedent. 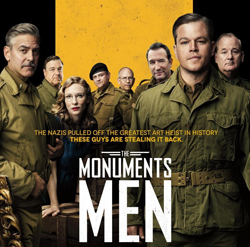 Tickets to The Monuments Men are guaranteed, not first-come, first-served. CAA will send the winners’ names to the film promoter, who will put them on the VIP list. You will not need printed tickets.